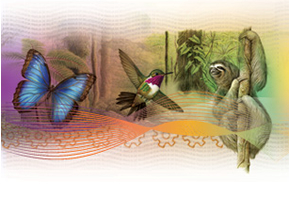 For many years, the largest currency denomination in Costa Rica was the 10,000 colon bank note (billete). At today’s exchange rate, that is a bit over $18.00. Thus, carrying just the equivalent of $1,000 required you to carry FIFTY-FIVE 10,000 colon notes… quite a wad. That will soon change as the Costa Rica Central Bank, Banco Central de Costa Rica, does a complete do-over of the country’s national currency. Changes to all bills (including the existing currency!) are drastic. Changes will include not only the standard anti-counterfeiting techniques standard on the Euro and the new US bank notes, but also two new denominations; the 20,000 and 50,000 colon bills. That is a Godsend! Additionally, the new bills will come in different widths… from 125 mm to 160 mm… truly important for the visually challenged. If this topic interests you and you would like a peek at the new bills, read on! Banco Nacional Gets it Right! Safe I nternet banking in Costa Rica has been an issue for some time. In December 2007, I wrote this post about how insecure it can be and giving suggestions on how to make it less so. It is clear that I have not been impressed with Costa Rica online banking at least from from a security standpoint… until now that is. I personally bank at three Costa Rica banks: BAC San Jose, Scotia Bank and Banco Nacional. 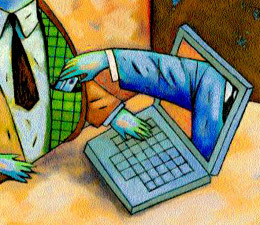 All were subject to various schemes that could easily cause serious security problems, especially if the customer did not use adequate security protection in their computers or worse, used Internet cafes or a wireless connection while banking online. Now along comes Banco Nacional with a high tech but easy-to-use gadget that all but guarantees your security even if banking from an Internet cafe or using a wireless connection. I got one about three weeks ago and have since been trying to figure out how someone could get into my account. My conclusion? They cannot or if they can, they are a whole lot smarter than I am. If this topic interests you, read on! One of my readers reasonably asked my thoughts on the recent revaluation of the dollar. Easy answer! I have not a freaking clue! Todays exchange rate of about ¢511.41 / ¢518.71 makes absolutely no sense whatever and to me, smacks of some serious manipulation. Lately, there have been a goodly number of news articles about people having their money stolen from their Costa Rica bank accounts. As some of you know, several of my companies here in Costa Rica are “high tech” related, especially the web hosting business where we host thousands of customers world wide. Server and computer security are paramount issues as you might guess. So when I got a phone call yesterday asking me my thoughts about this rash of Internet bank fraud and seeking advice, I decided rather than answer her question immediately, I would BLOG about it and maybe pass on some ideas for my readers. While this relates to the banking thing, it is really germane to ANY Internet transaction that uses passwords, bank information, credit cards or ANY confidential data. This will not be a “techy” post. I’ll try to keep it very basic so non-techies can understand what they can do (MUST do) to avoid Internet fraud. I am sorry, but this will be a long post, but I cannot recommend strongly enough that your read this. I expect my readers are might be a bit tired of all these posts about banking and the revaluation of the colon last week, but things are happening here that affect (especially) those expats living here. But, I have also received a lot of email about this topic, so here are some things I am noticing in my travels around San Jose in the past few days. I think they may be important. Back on August 12, 2007, I wrote a post entitled “The Colon Vs The Dollar – Watch your money!” In that post, I cautioned my readers that the weakening dollar could not long stand firm against the Costa Rica colon. I urged readers to move their funds from their dollar accounts (in Costa Rica banks) to colon accounts as I anticipated that the Central Bank had to act soon to bring the dollar down and increase the value of the colon. Last night, they did just that. The colon has been revalued to about ¢497 and ¢498.39 to the dollar. A few weeks ago, I wrote about three banks here in Costa Rica and how they compare. You can review that post HERE if you wish. The Colon Vs The Dollar – Watch your money! For many years I suggested here in this blog, in The REAL Costa Rica and elsewhere that the smart person living in Costa Rica (or for that matter anyone who keeps money here), should always pay using colones, but keep their money in a dollars account. There was a good reason for this. The colon was, for many years, on a system of scheduled devaluation that made holding colones a losing proposition. For some time I have wanted to write about banking in Costa Rica. Although the overall view of banking in Costa Rica is covered in two location in The REAL Costa Rica, see here and also here, those two pages really provide only an overview of the Costa Rica banking system and how it functions. They do not speak of actually dealing with individual banks and how it is to do business on a daily basis and to interact with individual banks. There are many banks here, and no one person could possible review all of them unless they actually had accounts in all banks, a scary thought indeed. I use three banks here, one state bank and two private banks, so today I am going to rate these banks based on my experiences over the past several years. This is a very long post, but I saw no way to shorten it. If this topic interests you, then read on! Also, see my follow up regarding BAC San Jose. Better Interest Rates in Costa Rica? After the demise of the several high interest houses a few years ago, Costa Rica lost its appeal as a place to get thirty plus percent annual interest rates in a supposed secure offshore environment. Couple that with the influx of baby-boomers and retirees and I often get asked for secure locations where money can be kept at decent interest rates. Here are some of my ideas, and while I am for sure not a financial planner or expert in these areas, I can shed a bit of light on your options here. Our money needs change as we age. A thirty-something person or couple can afford a lot more risk in their money management style knowing that they have another 30-40 years to “balance” the ups and downs. A bad stock decision is far less important at age 32 than at age 62. Therefore, I am directing this post to the over 50 crowd who are not in the market for a $2 million beach front home in Costa Rica. If you can afford that, then you have little need for anything I have to say.